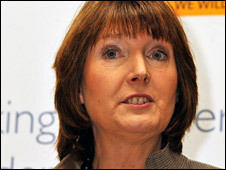 Class is more important than gender or race in affecting life chances, Harriet Harman has said in a speech. A government-commissioned report out next week, will show how inequality carries from "one generation to the next", the equalities minister said. She blamed the 1990s Tory government for a "vast legacy of inequality". But her Conservative shadow Theresa May said social mobility had "stalled" over 12 years of Labour rule and inequality had "got worse" since 1997. Ms Harman, who is also deputy Labour leader, gave a speech to the left-leaning think tank Compass in which she referred to the report by Professor John Hills of the London School of Economics - due to be published next week. She said: "Equality must, of course, mean the absence of discrimination on grounds of race, gender, faith, sexual orientation, disability and age. "But we also know that overarching and interwoven with these strands is the persistent inequality of social class - your family background and where you were born." It follows remarks by her cabinet colleague John Denham that disadvantage in the UK was now more closely linked to poverty, class and identity than ethnicity - seen as a response to the successes of the BNP with white working class voters. The report is expected to say that poorer children are less ready to learn when they start school than those from richer families and will do worse throughout the education system. It will also point to statistics suggesting people in the richest parts of the country live 13 years longer, on average, than those in poorer areas. Ms Harman said it would show that "public policy intervention works and has played a major role in halting the rise in inequality which was gaining ground in the 1980s". She said without her government's actions, inequality would have been worse and that they had been successful in stopping "substantial growth in income inequality" and narrowing pay differences between men and women. She said voters at the next general election faced a choice between a Conservative government which, she said, would "turn the tide on making Britain fairer" and Labour which "recognises the challenge of inequality" and has "the policies to tackle it". But for the Conservatives, Theresa May said Ms Harman's speech was a recognition that "inequality has got worse under Labour". "All she can do is reach for the old-fashioned response of class war," she said. "Over the last 12 years social mobility has stalled, so it is even harder to escape poverty. Labour's failure has been a result of their one-dimensional approach. "Unlike Labour, we will deal with the causes of poverty and inequality, including educational failure, family breakdown and worklessness." For the Liberal Democrats, Lynne Featherstone said: "This government's record on tackling inequality has been pathetic and the gap between the haves and the have-nots has widened under Labour." Ms Harman is trying to get her Equality Bill - which would impose a responsibility on local authorities to tackle social inequality - through Parliament, but it is facing resistance in the House of Lords. Ms Featherstone said proposals in the bill were "weak, won't deliver the necessary reforms and like Harriet Harman's speech, demonstrate merely gesture politics".